Cottage Country Reflections: Mommy, help me! We took a drive towards the park at the end of September. An open house for a new development. 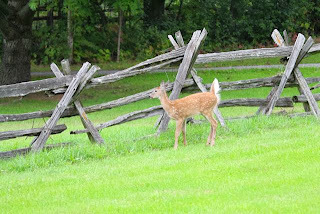 The fawn was on the highway side of the fence, Momma was on the property. All these places have tons of bush, with much forest about. I approached to take a photo, with the 400mm zoom, and momma got upset. She ran away from me. The doe walked down to the driveway, where the fence ended, fawn followed and leaped over the fence before it got to the end. Teaching baby a lesson! 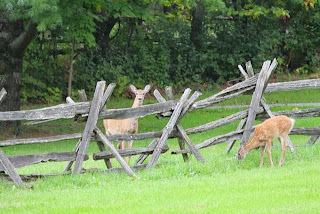 They are so sweet...I love the deer around our summer place here. So sweet. I need to sell this place and get to my new place before I miss everything. sweet ones. 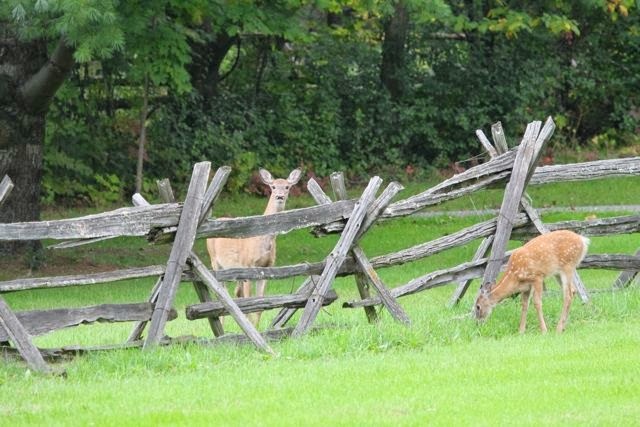 great fence, too.